Basic and Sumberac’s ‘Snow White’. Zdenko Basic and Manuel Sumberac, originally animators, make up the illustration duo that create fantastically striking picture books that are dark and stylised. Their background in animation can be seen through their use of 3D looking characters and sets, as well as the dramatic sense of motion and atmosphere in their illustrations. Stella Gurneys ‘Snow White’ is illustrated by Basic and Sumberac. 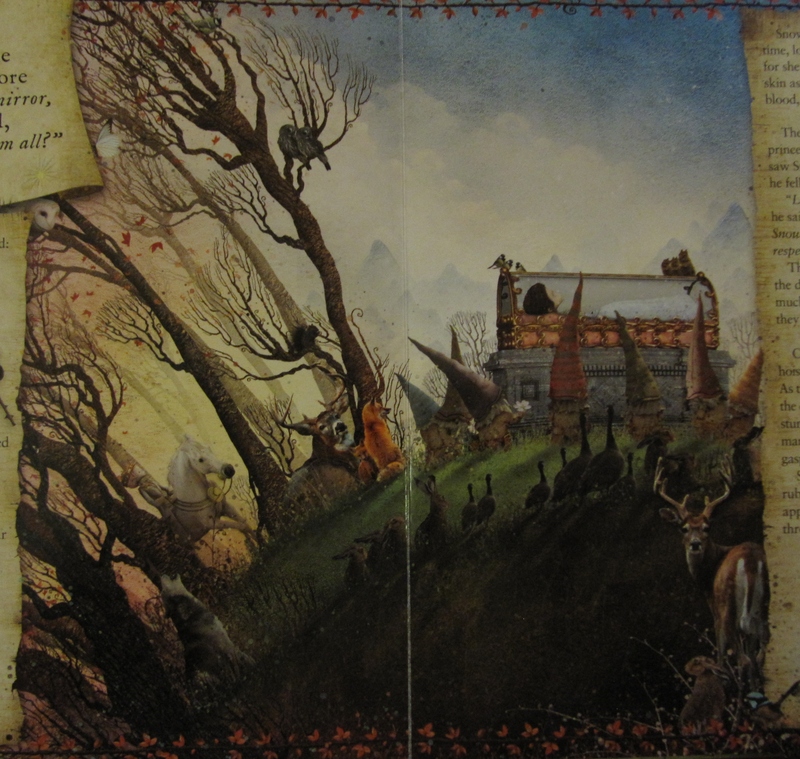 For this classic fairytale they created wonderful illustrations full of detail and strong narrative. 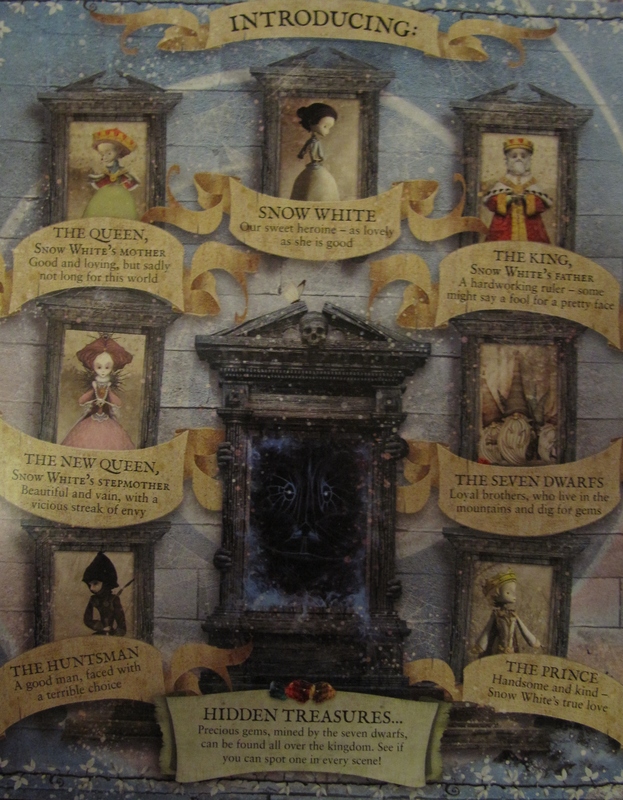 They have a very distinct style, particularly in their character designs. All the people are very long and tall, with spindly limbs and large heads. With their pale skin and hollow eyes there is a feel of Tim Burtons’ unmistakable style to them. Basic and Sumberac use colour very cleverly in this book as they use it to set the mood and atmosphere of the story. During the more sinister parts of the story they use dark and moody colours to create a sense of danger, and in the happier parts of the tale like the ending they use softer pastel colours to show that all is well. Basic and Sumberac make use of texture and collage in all of their illustrations. Throughout the book they use subtle paint splatters and old looking parchment to create a textured antiquey surface. Collage is used a lot but also very subtly. Some real animals, food and objects are collaged into the illustrations, but because of their 3D and serial nature it is not very obvious. I feel this a good example of a post modern picture book, as it includes quirky extras to the story. 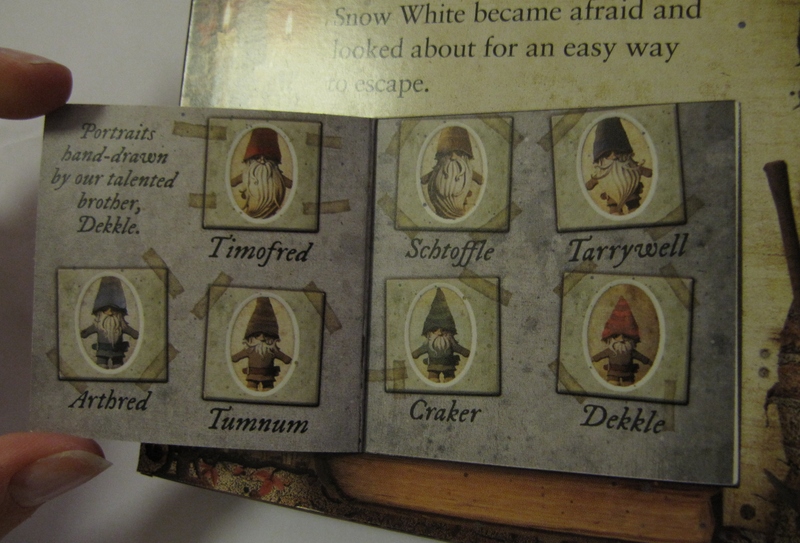 Such features are the framed character profiles at the beginning of the book and small books you can flick through within the story, like the dwarves family photo album and the evil queens spell book. There is also a precious gem to be found in every scene. This engaging book also includes flaps to open, wheels to spin and a fantastic pop- up scene on the final page. These interactive elements are very appealing to children and make them enjoy the story on another level. Basic and Sumberac are obviously very good at digital work too, as I believe they use it in all of their illustrations to adjust the colours, lighting, depth and textures. Their enchanting and impressive illustrations make this version of the classic tale of Snow White edgy and modern. This picture book I feel is aimed at older children as the story is lengthy but mostly because there is a maturity to the illustrations with underlying darker tones. 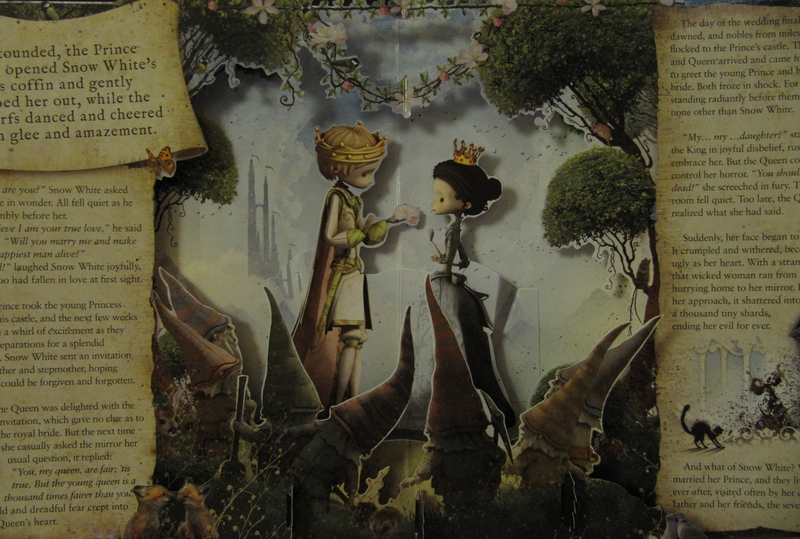 I love their stylistic designs and envy their subtle use of texture and collage.